Okay, here’s the deal. If you are buying a “a unit of wood cut for fuel equal to a stack 4 x 4 x 8 feet or 128 cubic feet,” then that’s a cord (M-W). If you are a strumming on your guitar by the fire that you have built using some of the wood from the cord you just bought, then you are playing a few chords (“three or more musical tones sounded simultaneously,” M-W). 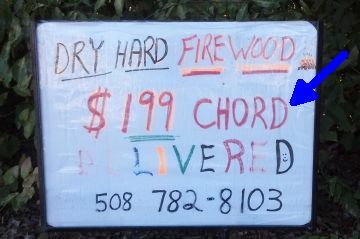 If you get a very good deal on your cord of wood, you might be getting it for a song. But that’s a lot of chords. Usually. Unless it’s a very boring song. Then maybe only one chord. But that’s a different story. If you sing along with those guitar chords, you are using your vocal cords.